There are plenty of web browsers around these days and if you don’t like one, you can just move onto the next one. If you’re looking for something more memory or resource friendly, or a browser that displays webpages better or has plug-in expansion, there’s a web browser around that will likely do what you want. Personally I use both Mozilla Firefox for the bulk of my browsing and if there’s a particular website that it can’t support 100%, then Internet Explorer comes in handy, although Firefox is pretty much spot on with most websites these days. What I really liked about Firefox is it is able to save cookies so that I don’t need to login the next time, username and passwords and even double protect it with Master Password, list of visited websites and also the bookmarks. I know Internet Explorer and most other modern browsers can do the same but somehow I prefer how Firefox does everything. With so many custom settings that are stored inside Firefox, if any of your profile data or files get corrupted for some reason, it can be a real pain trying to remember things like usernames and passwords, or you bookmarks and visited websites. It has happened to me before, so now I backup my Firefox profile data regularly just in case it happens again. I found a tool to do this years ago and have been using it more recently to backup my Mozilla Firefox profiles. 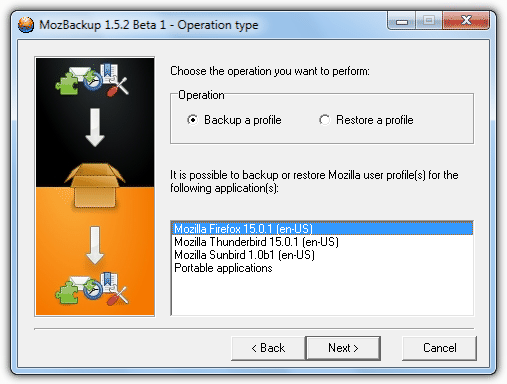 The program in question is MozBackup and is very useful to backup and restore Firefox profile data. Settings that can be backed up are; general settings, bookmarks, history, extensions, saved passwords, cookies, saved form details, the list of downloaded files and site certificates. Besides Firefox, it can also handle backing up and restoring options like address books, emails and account settings for other software such as Mozilla Thunderbird, Sunbird, Postbox (Express), SeaMonkey, Spicebird, Songbird and Wyzo. MozBackup is a portable tool that’s free for personal and commercial use and works on just about all Windows versions including Windows 98, ME, XP, Vista and 7. The zip file is less than 1MB in size and the interface is very easy to use being more of a wizard driven number of steps. Whichever profile you’re backing up, you need to make sure its application is closed beforehand and not running. here’s a simple demonstration of how easy it is to use MozBackup to backup your Firefox profile. 1. Launch the program and choose whether to backup or restore your profile and which application you want to perform the action on. In this case it’s Firefox. 2. 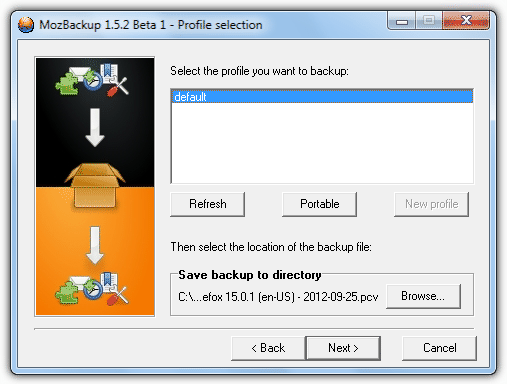 Select the profile you want to backup, if there is only one it will be selected already. More recent updates to MozBackup also have the ability to manually locate profiles from a portable Firefox. If you want to do that, press the Portable button and point to the folder your portable profile is in. The backup will save to My Documents / Documents by default which you can obviously change if you want to. 3. 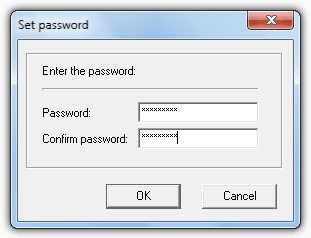 After choosing the profile to backup, there will be a prompt asking whether you want to password protect your backup file. This is a useful but not required security feature so that no one else can restore your profile on another computer. 4. Finally, select which details that you want to backup. 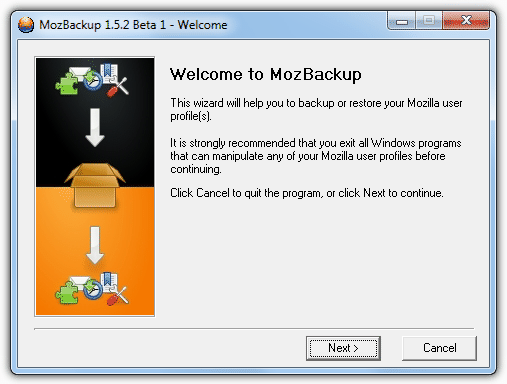 MozBackup will auto detect which software you’re backing up and make the appropriate Details available for selection. Extra files such as the NoScript database can be selected to be included in the backup through the “Unknown files” button. The backup will then be created and will have a file extension of .PCV which you obviously keep safe until required. The restoration process is pretty much a reversal of backup, just make sure to select the correct backup file from the profile selection screen. it works, thanks a lot Raymond. I always looking for something like this! Thanks a lot.